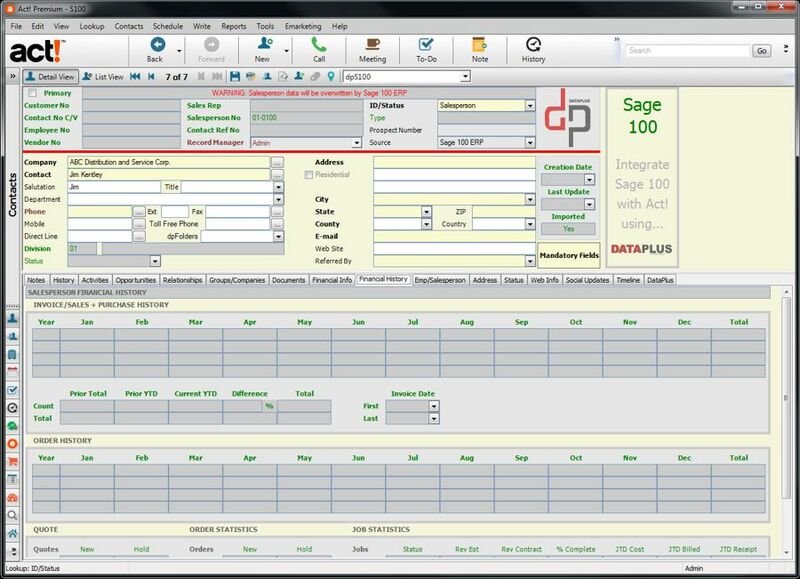 An all-in-one business management tool will help you spend more time working in your business rather than working on your business! 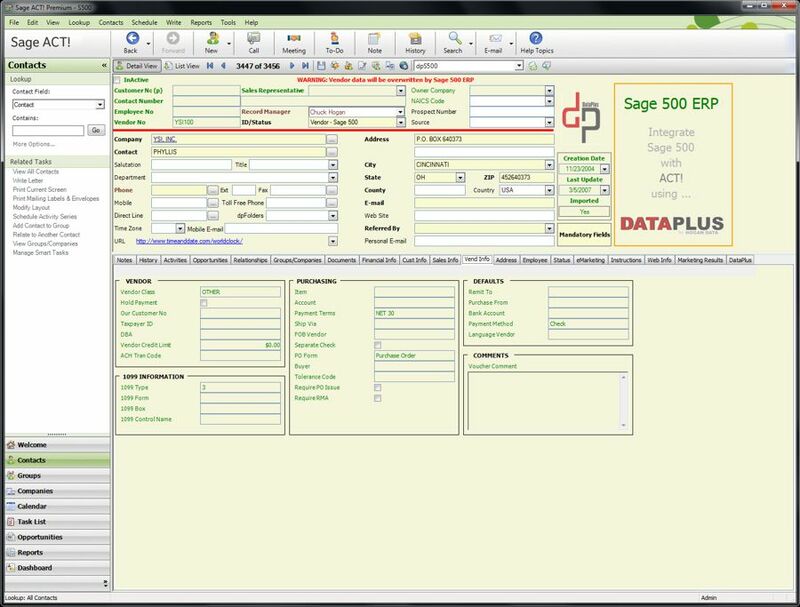 Using DataPlus, Act! 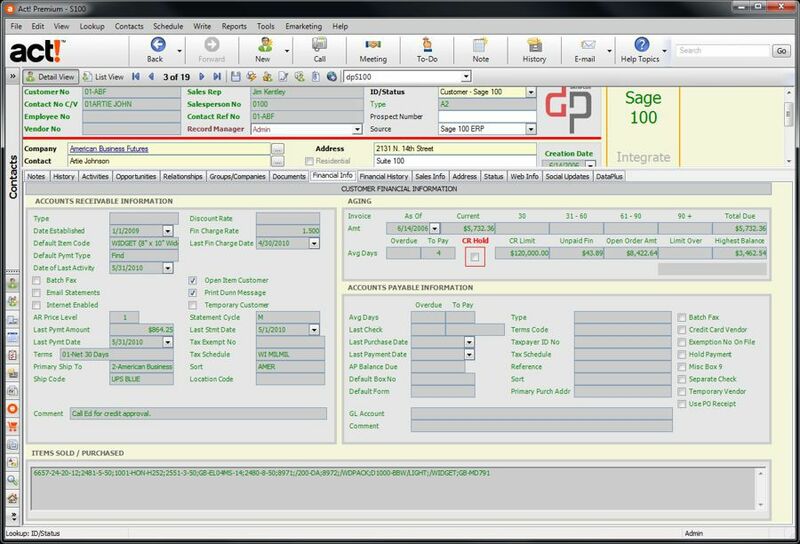 users access critical and statistical information from Sage 50 in Act fields for Customers, Vendors and Employees! 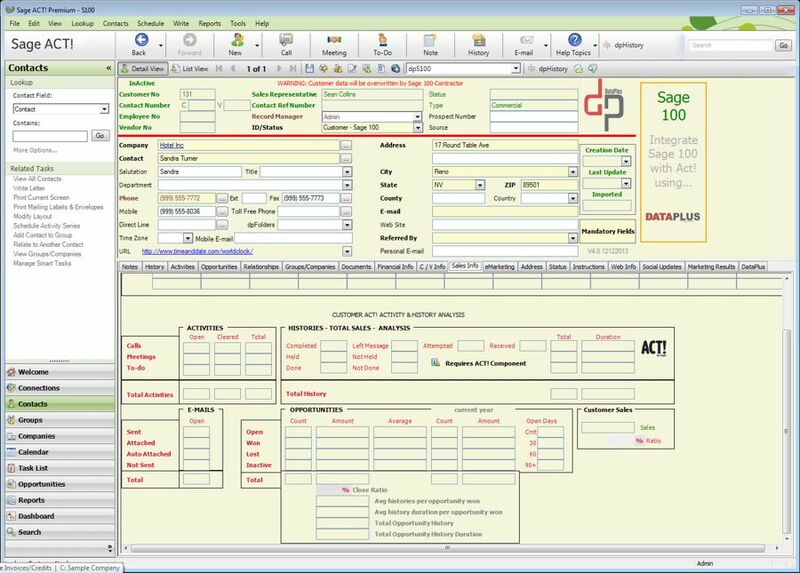 Create Customer, Vendor and Employee from Act! 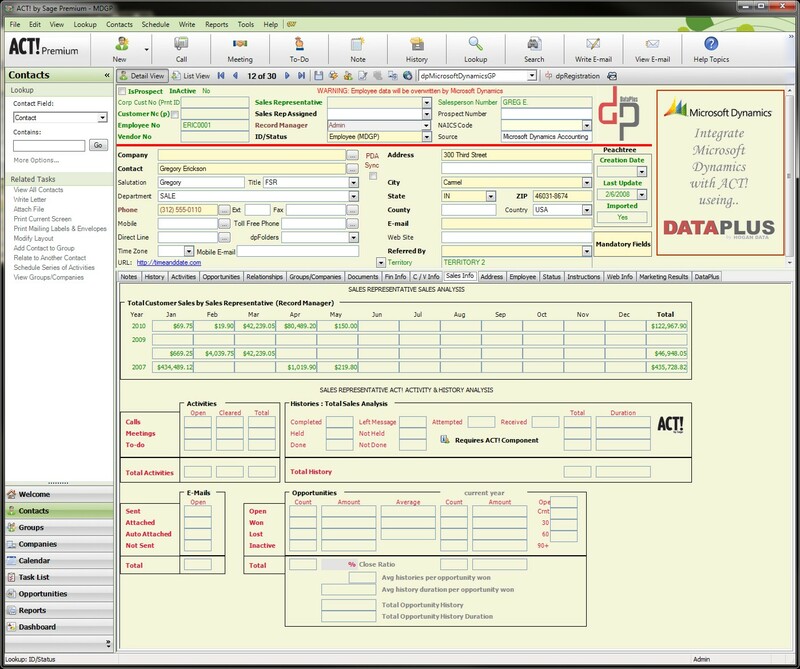 Edit Customer and Vendor from Act! 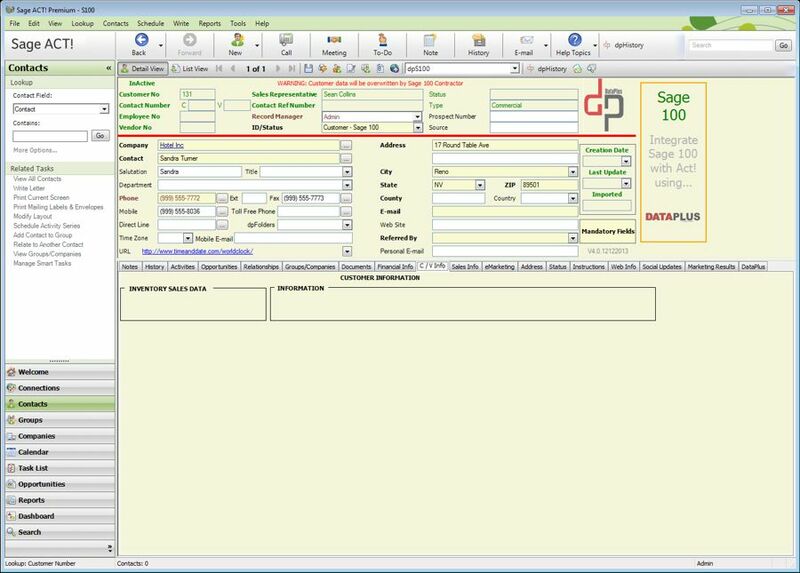 Security access controls for Sage 50 data in Act! 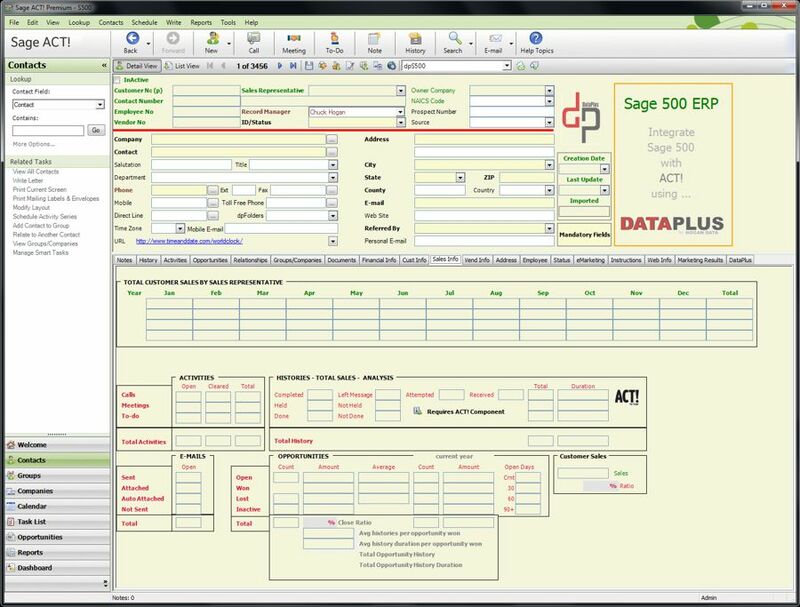 Using DataPlus, Act! 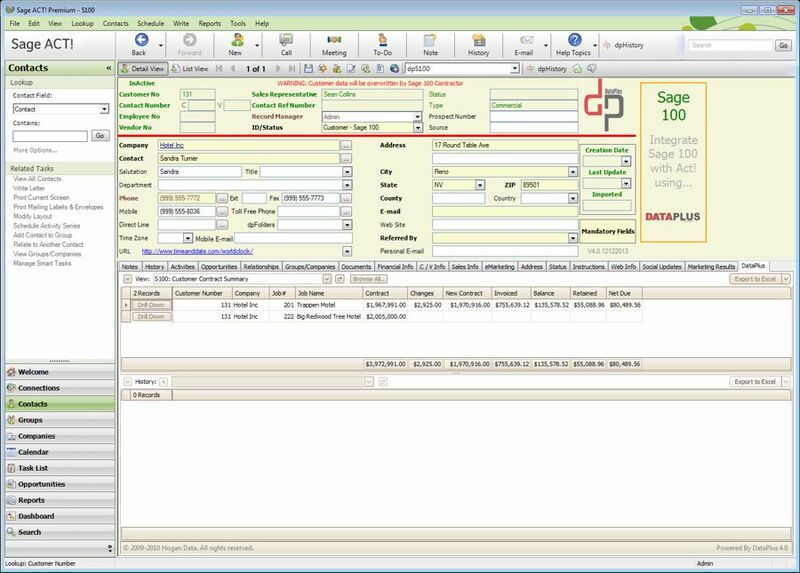 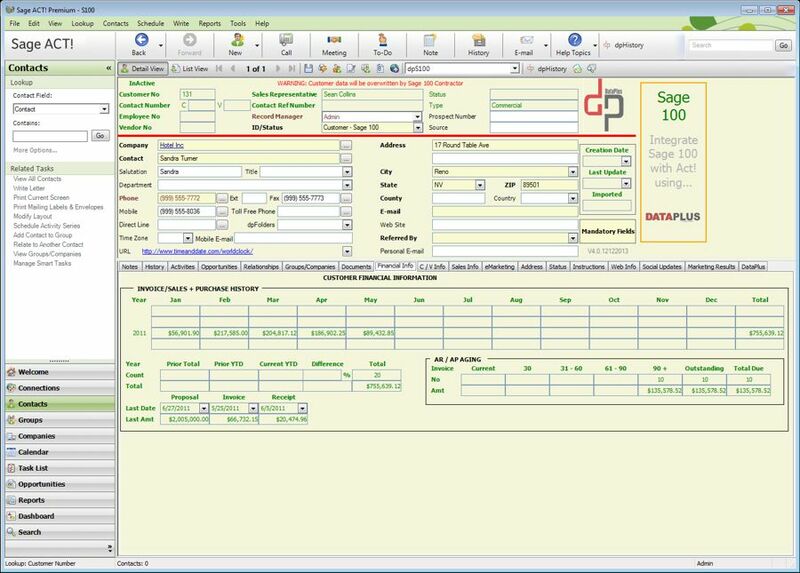 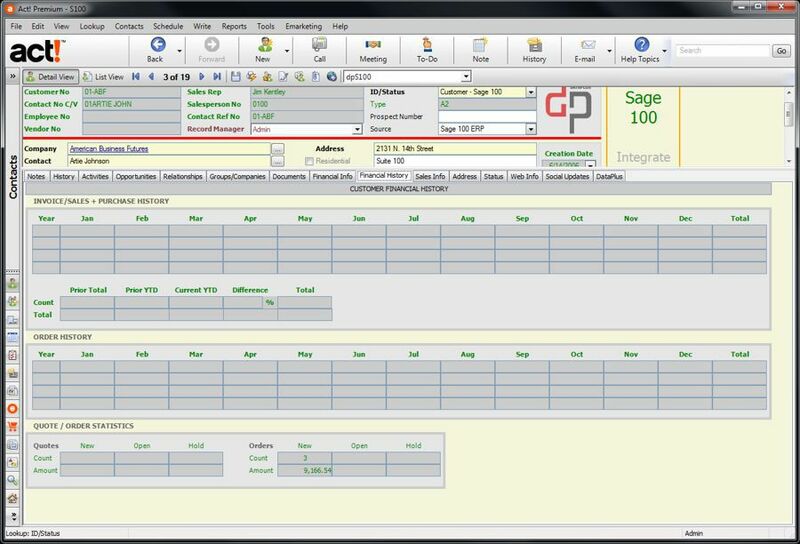 users access critical and statistical information from Sage 100 in Act fields for Customers, Vendors and Employees! Security access controls for Sage 100 data in Act! 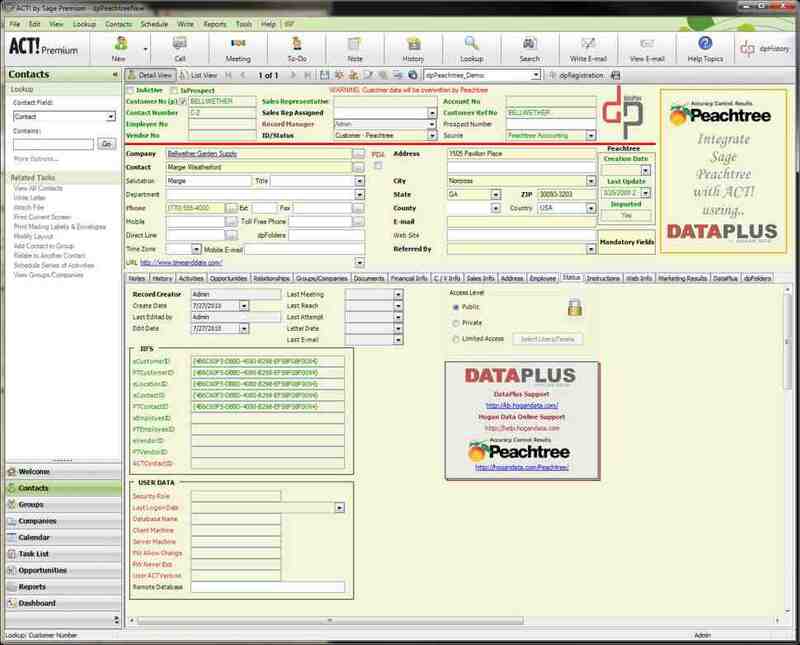 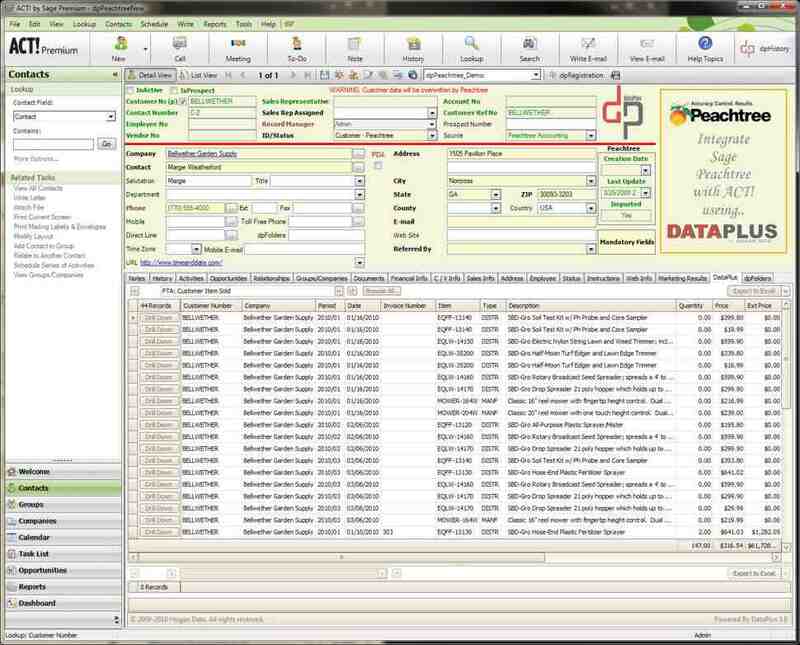 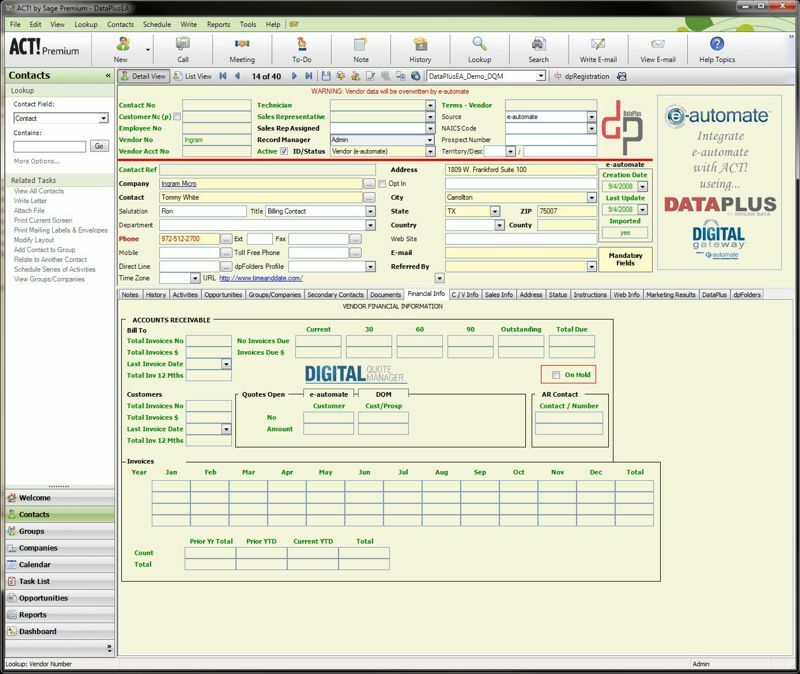 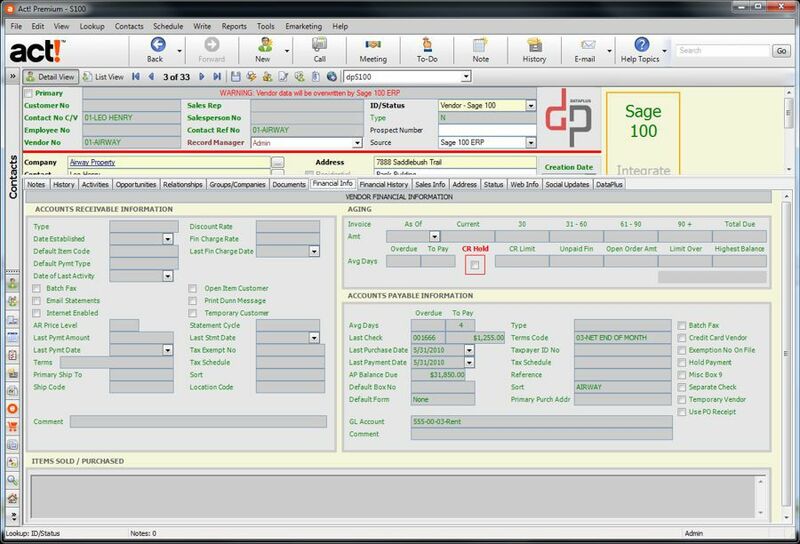 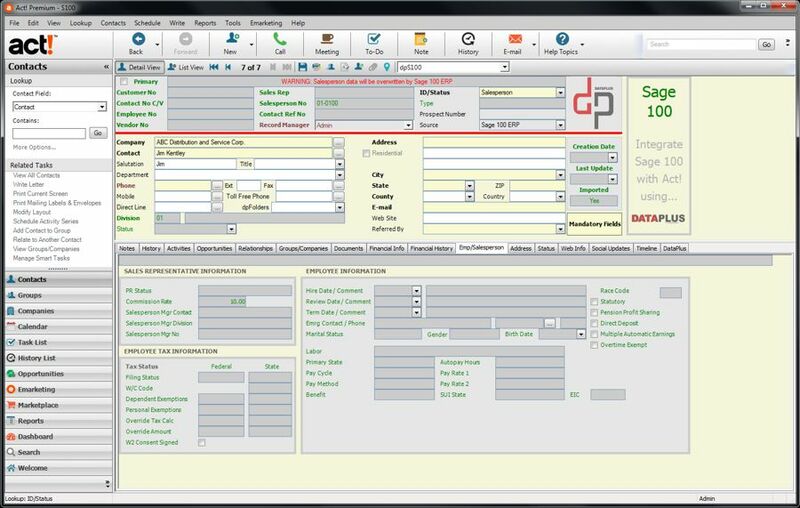 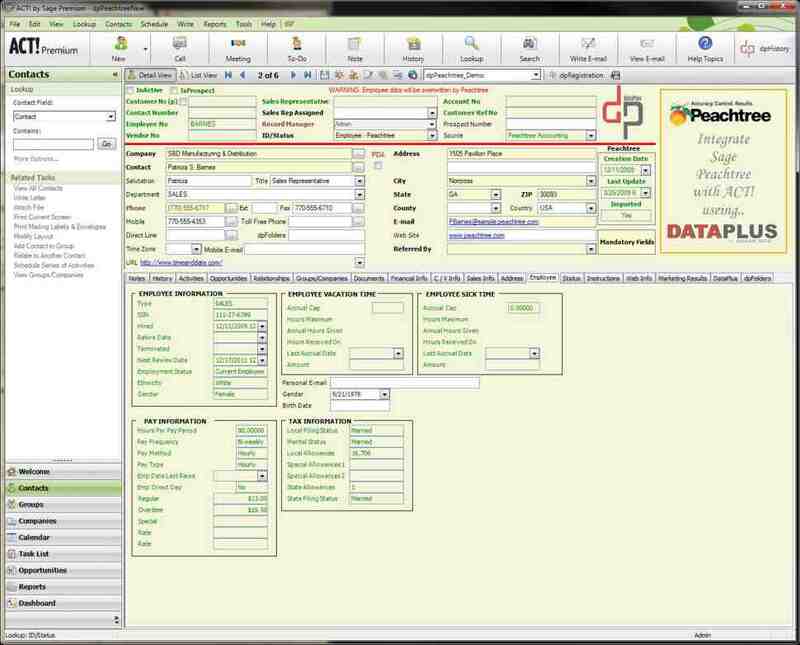 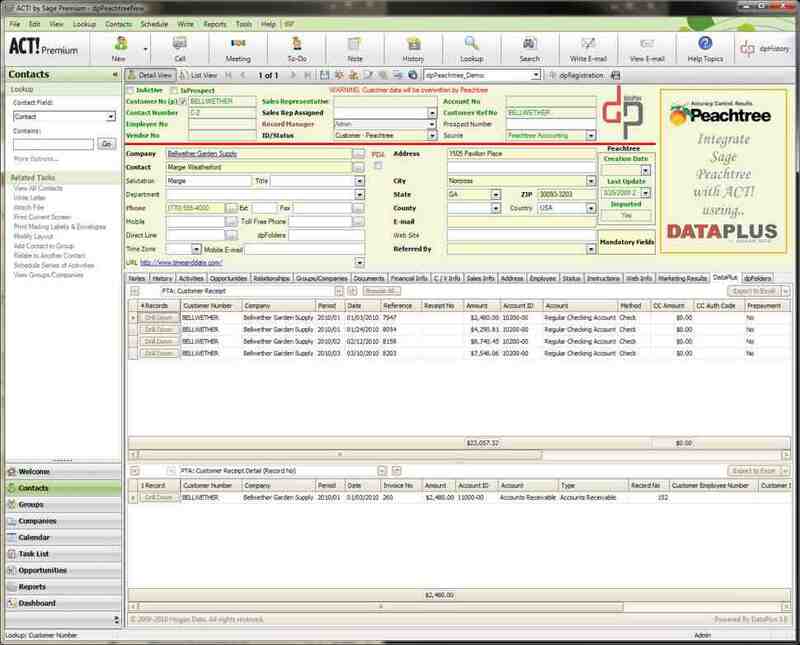 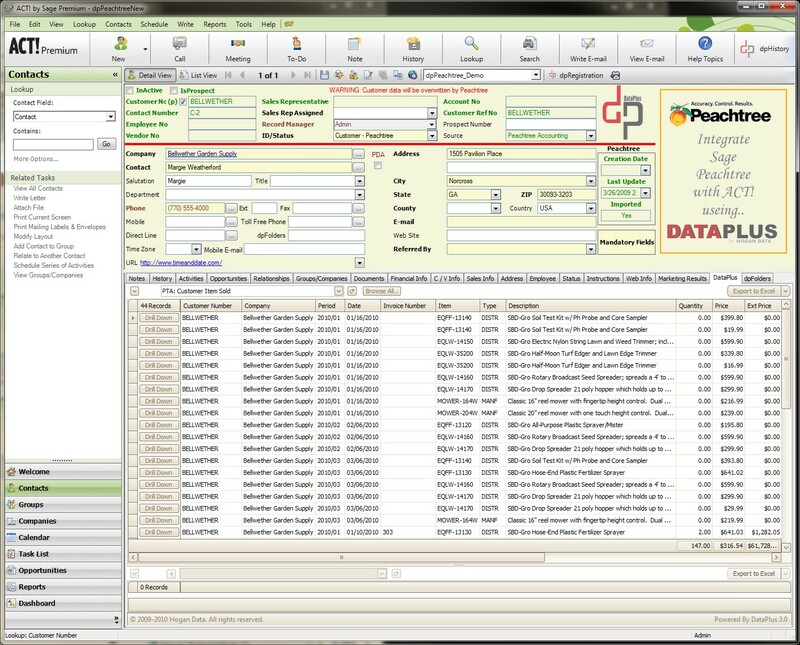 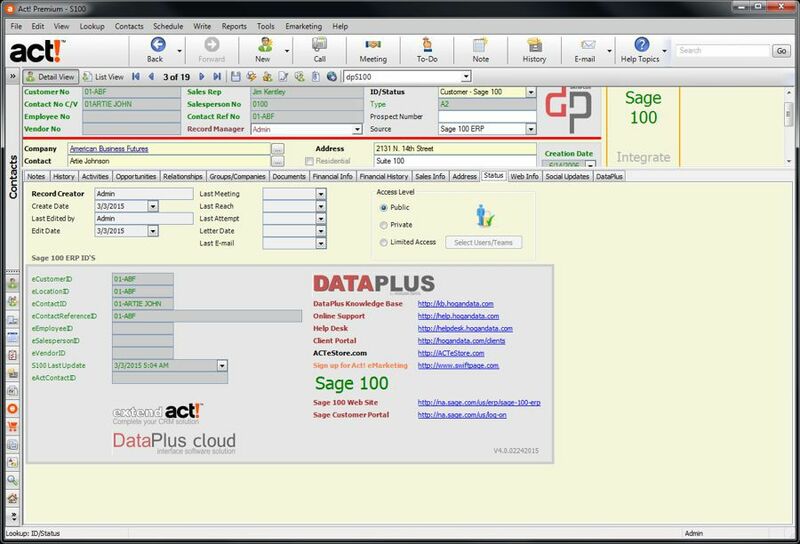 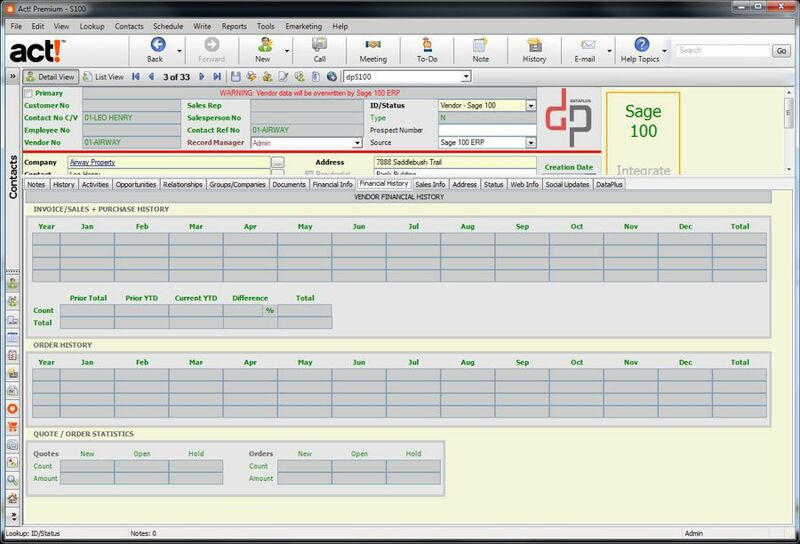 Click on Sage 100 Tab in Act and create "Customer"
Click on Sage 100 Tab in Act and create "Vendor"
Click on Sage 100 Tab in Act and create "Job"
Using DataPlus, Act! 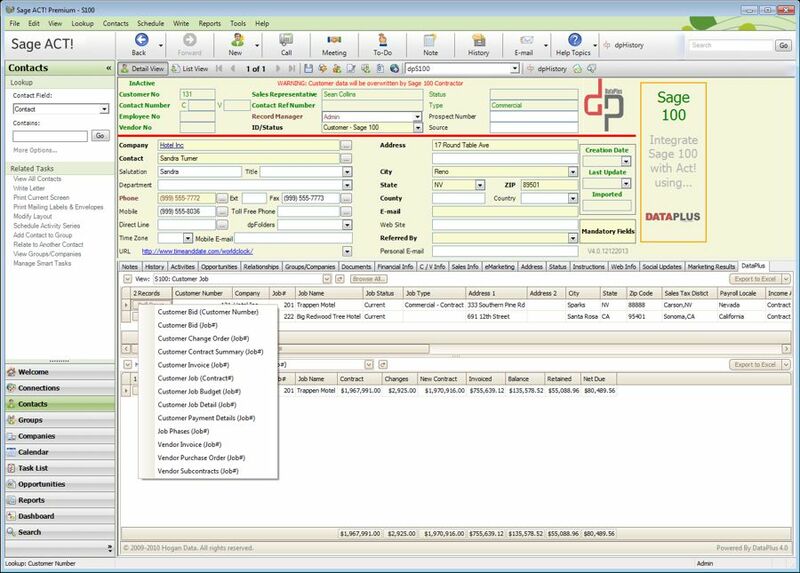 users access critical and statistical information from Sage BW in Act fields for Customers, Vendors and Employees! 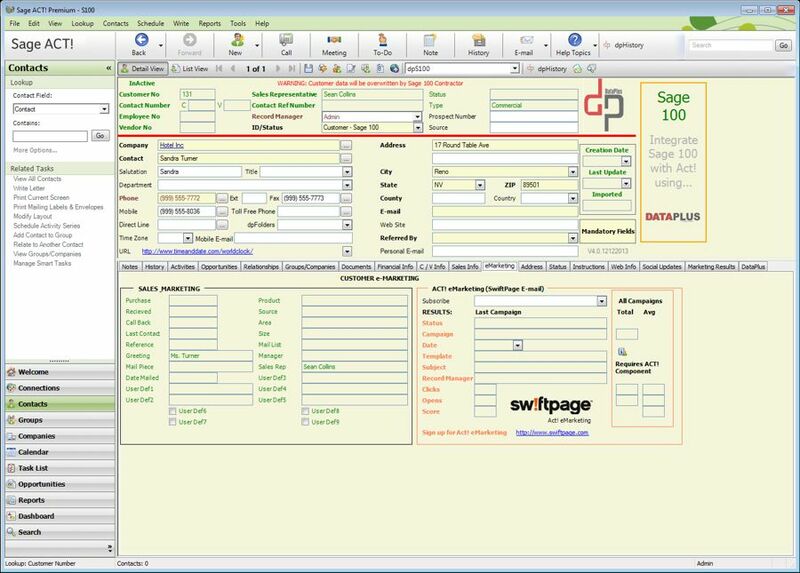 Security access controls for Sage BW data in Act! 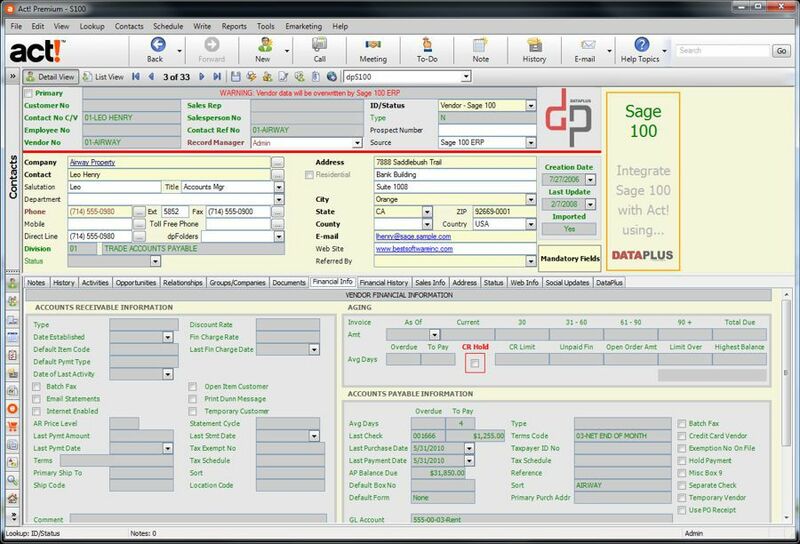 Using DataPlus, Act! 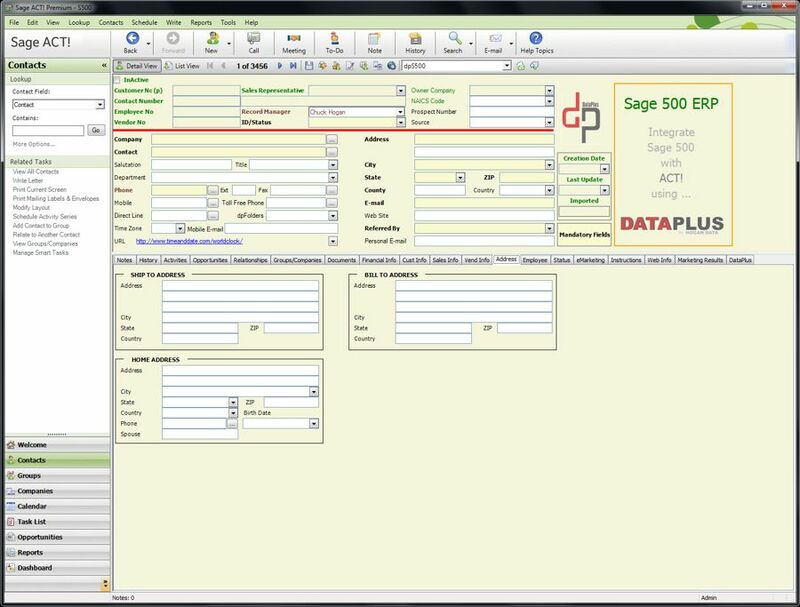 users access critical and statistical information from Sage 500 in Act fields for Customers, Vendors and Employees! 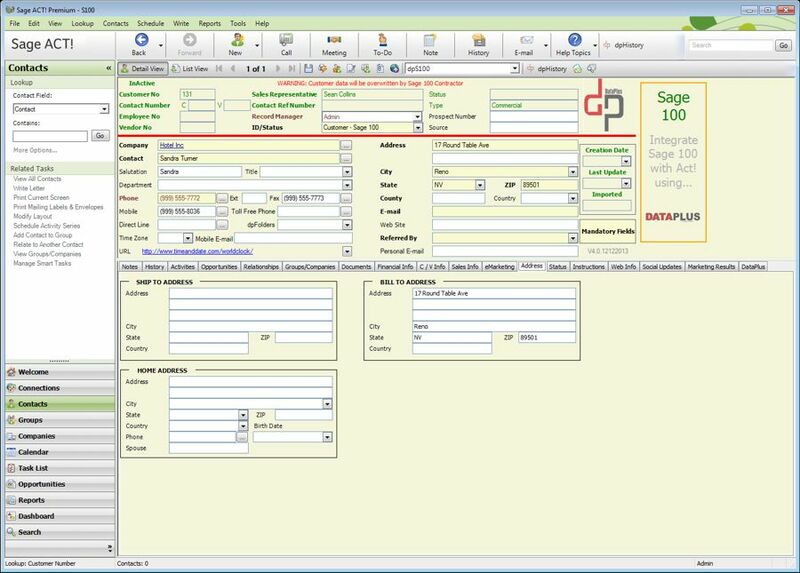 Security access controls for Sage 500 data in Act! 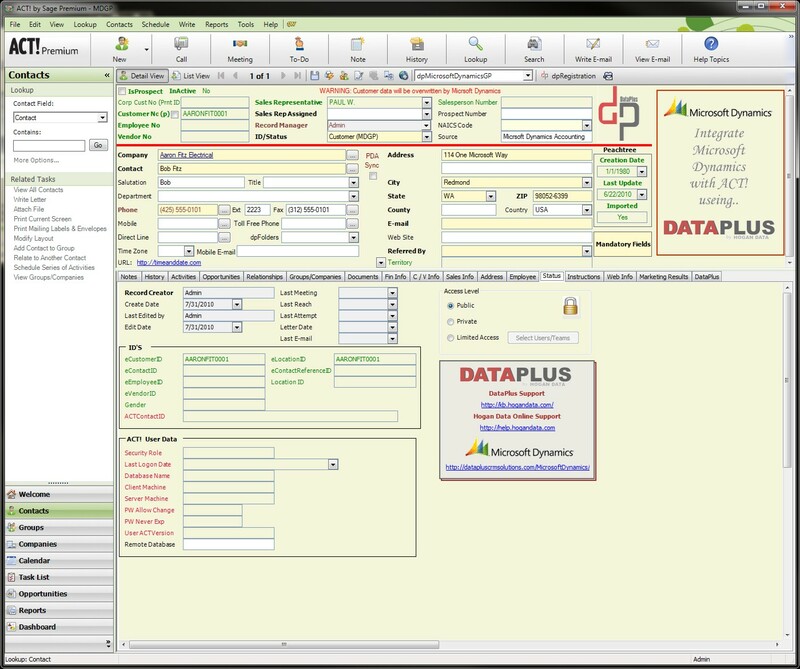 Using DataPlus, Act! 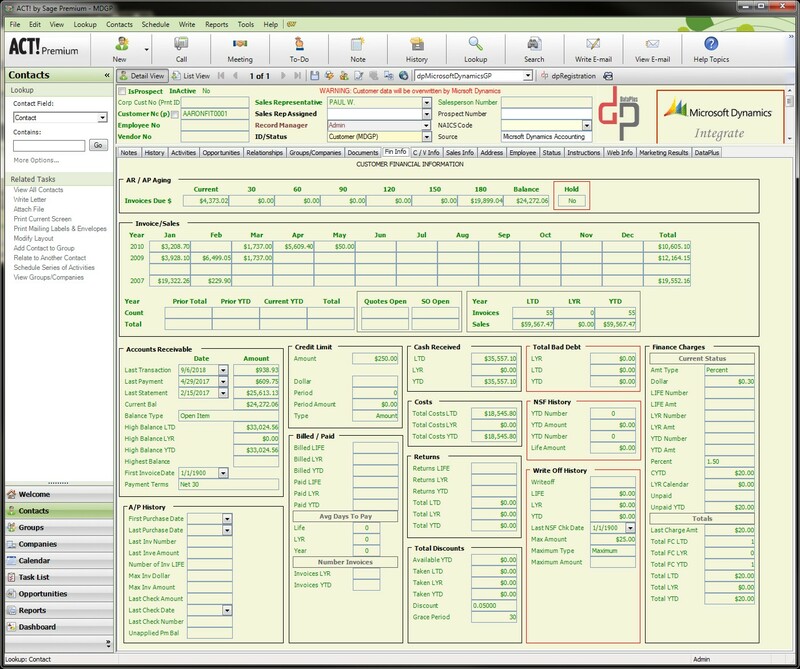 users access critical and statistical information from QuickBooks in Act fields for Customers, Vendors and Employees! 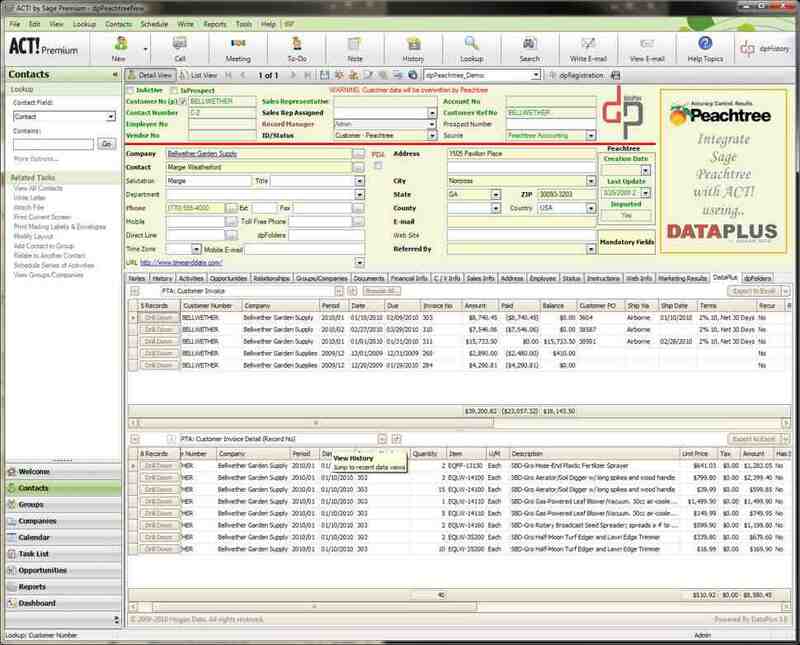 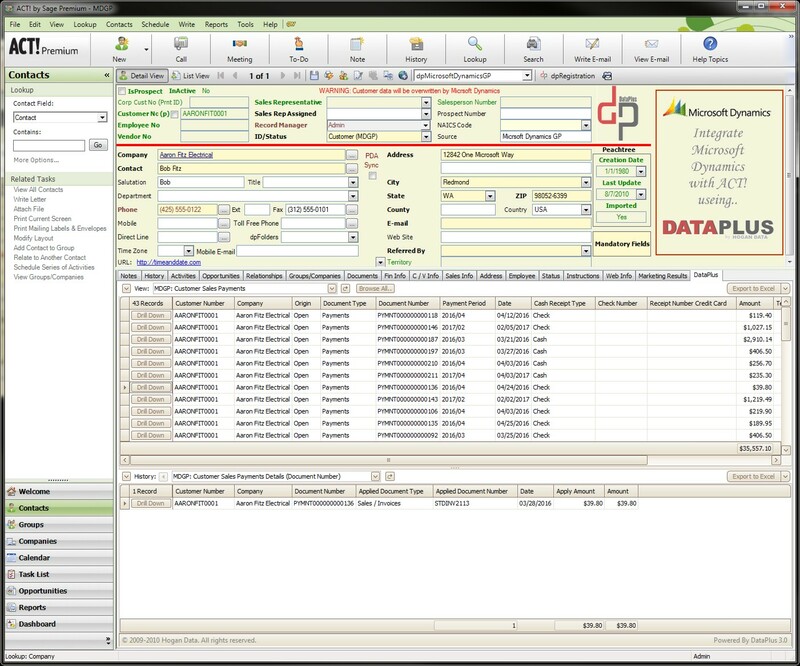 Security access controls for QuickBooks data in Act! 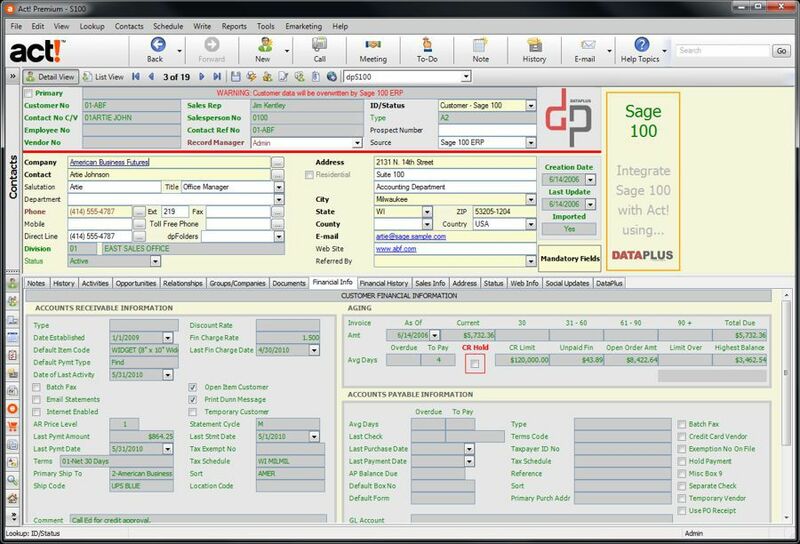 Using DataPlus, Act! 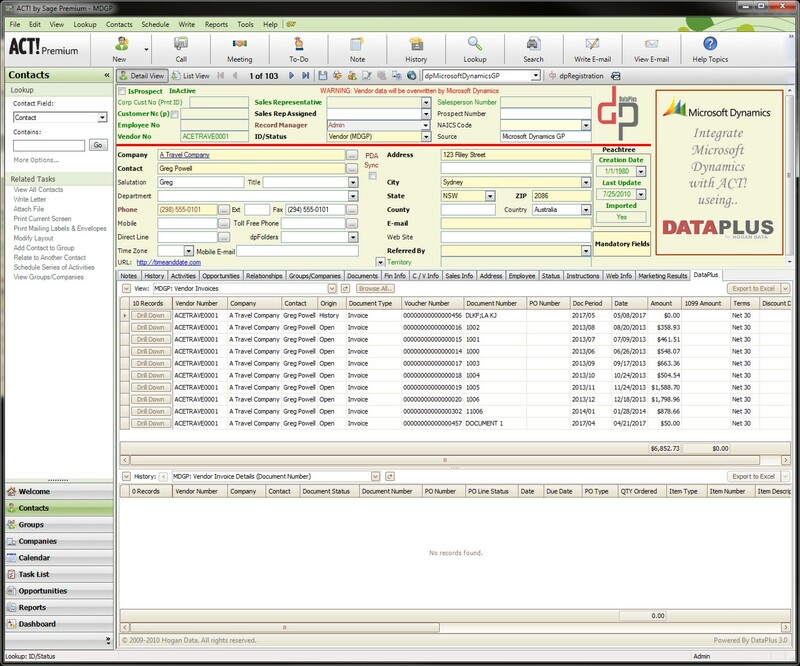 users access critical and statistical information from MDGP in Act fields for Customers, Vendors and Employees! 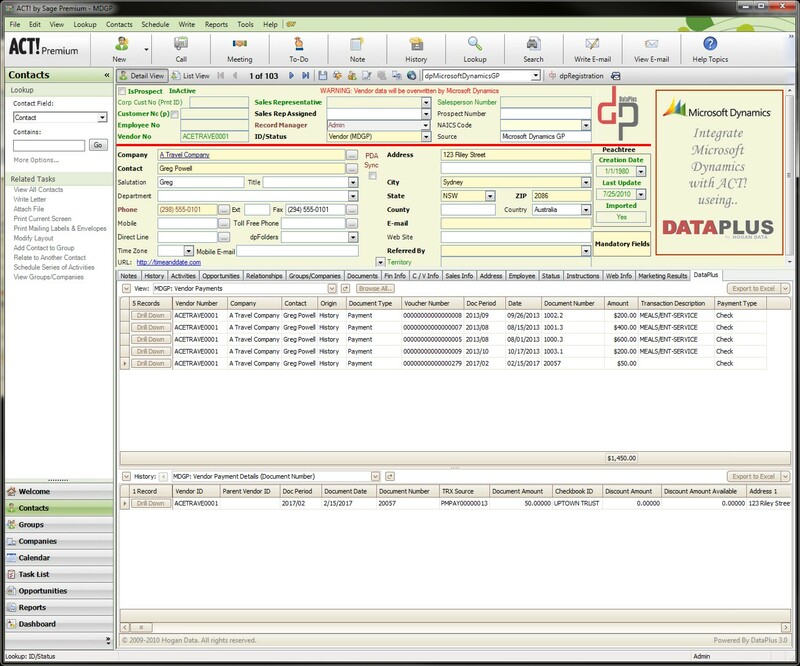 Security access controls for MDGP data in Act! 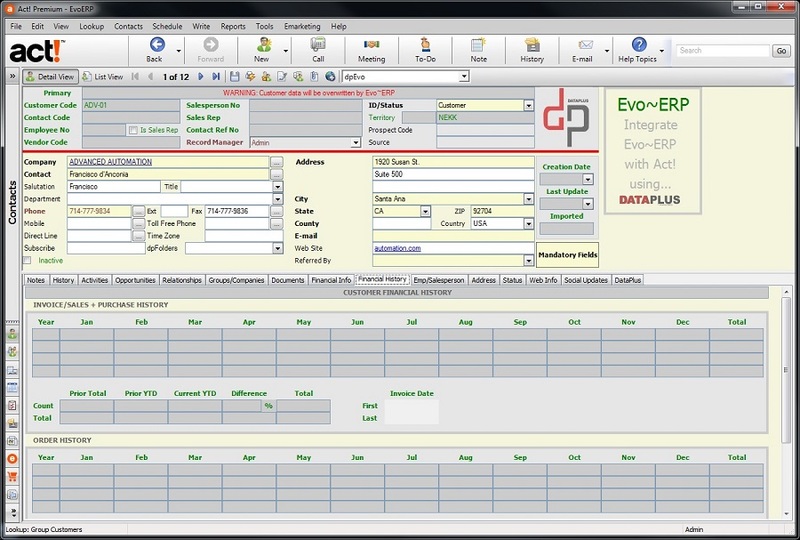 Evo ~ ERP to Act! 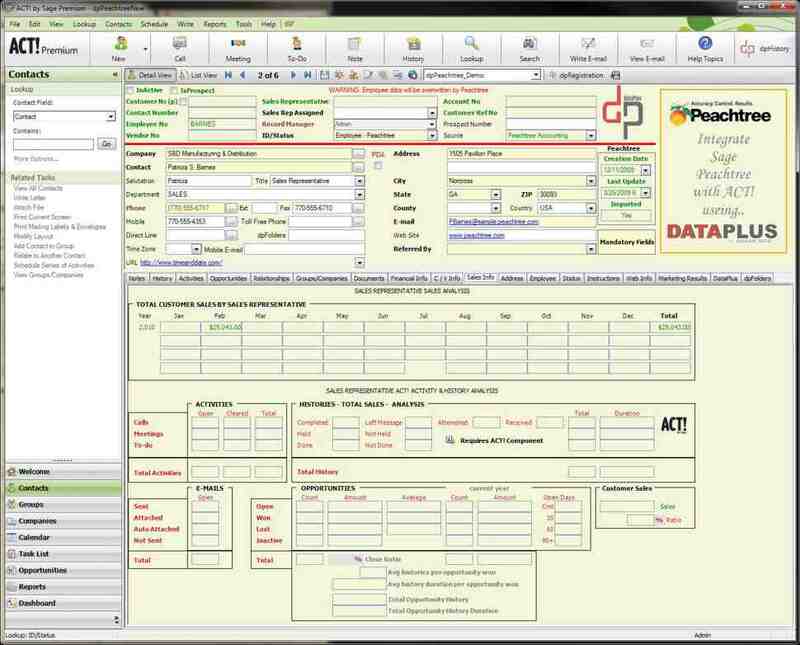 Using DataPlus, Act! 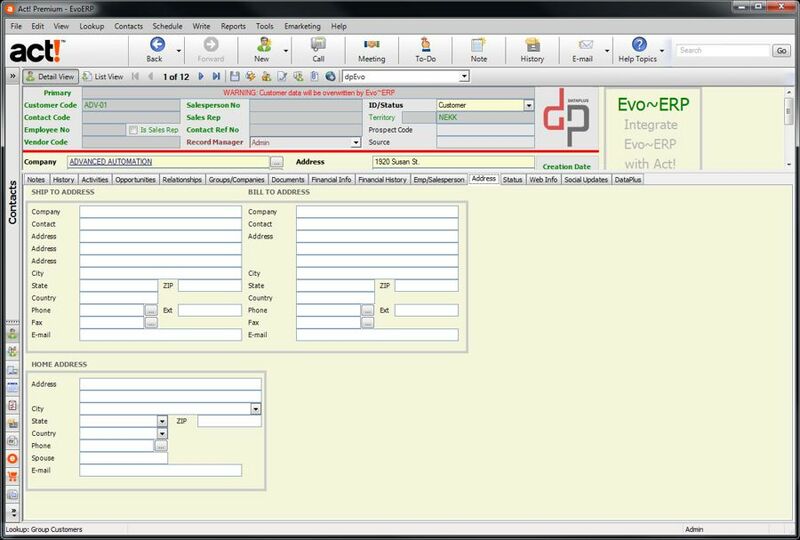 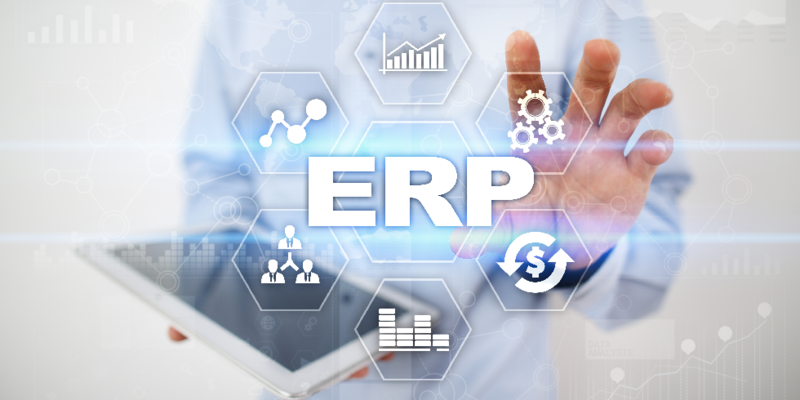 users access critical and statistical information from Evo ~ ERP in Act fields for Customers, Vendors and Employees! 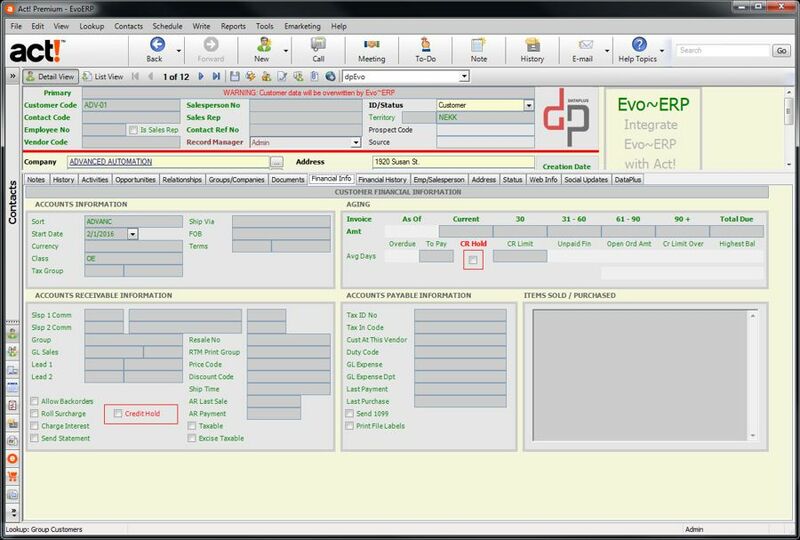 Security access controls for Evo ~ ERP data in Act! 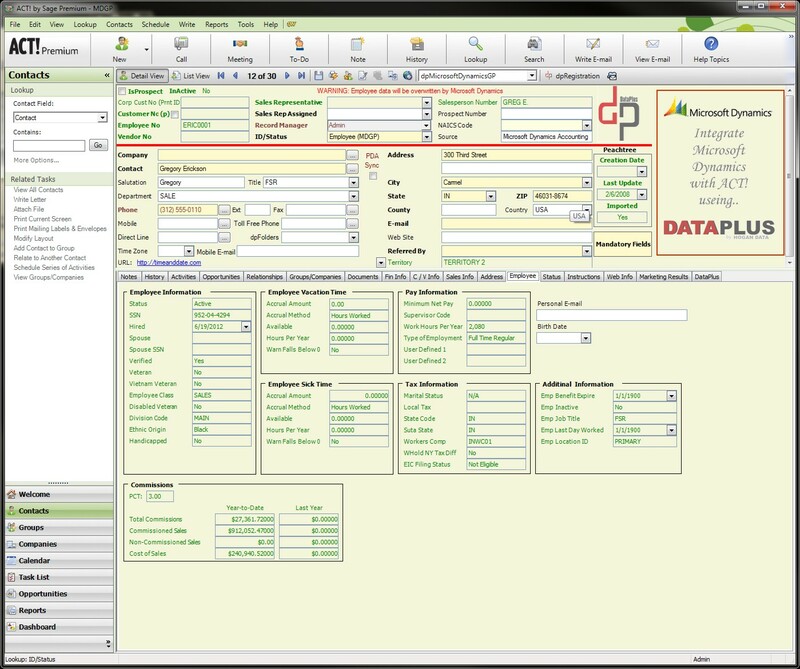 Using DataPlus, Act! 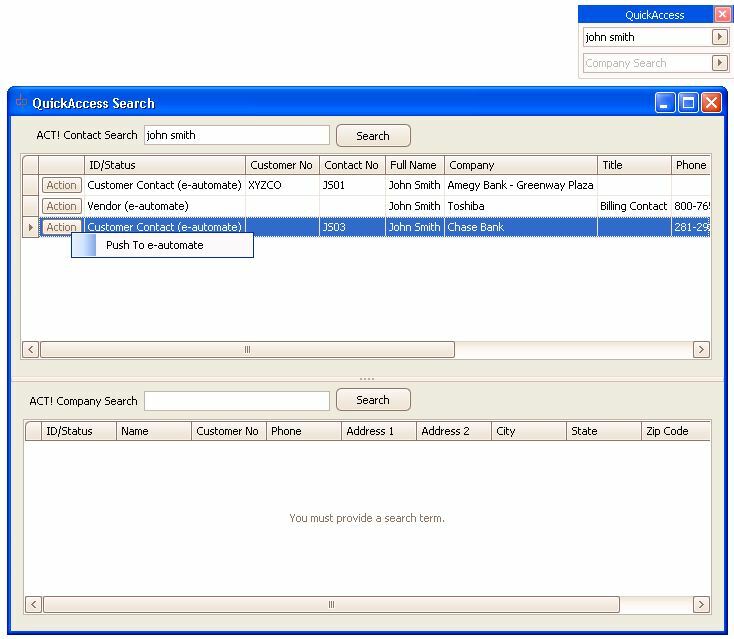 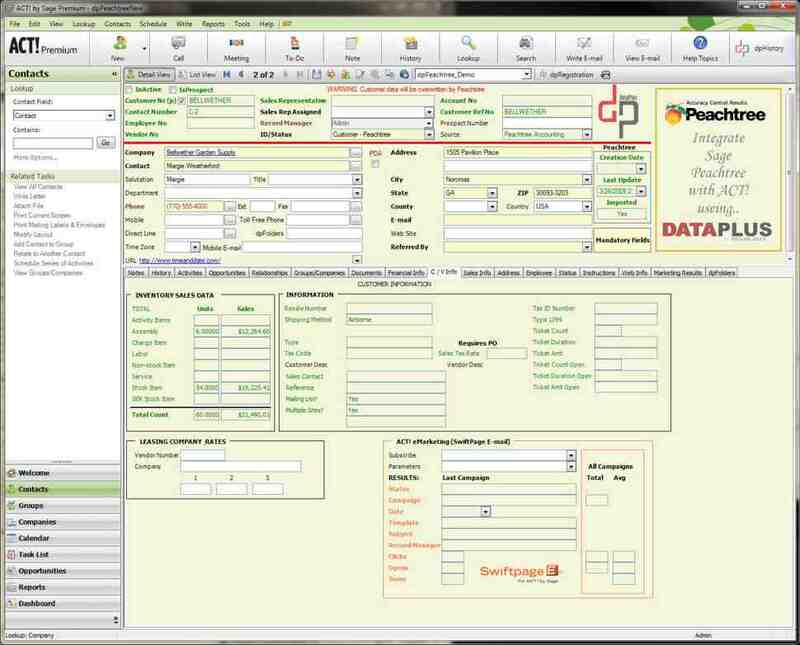 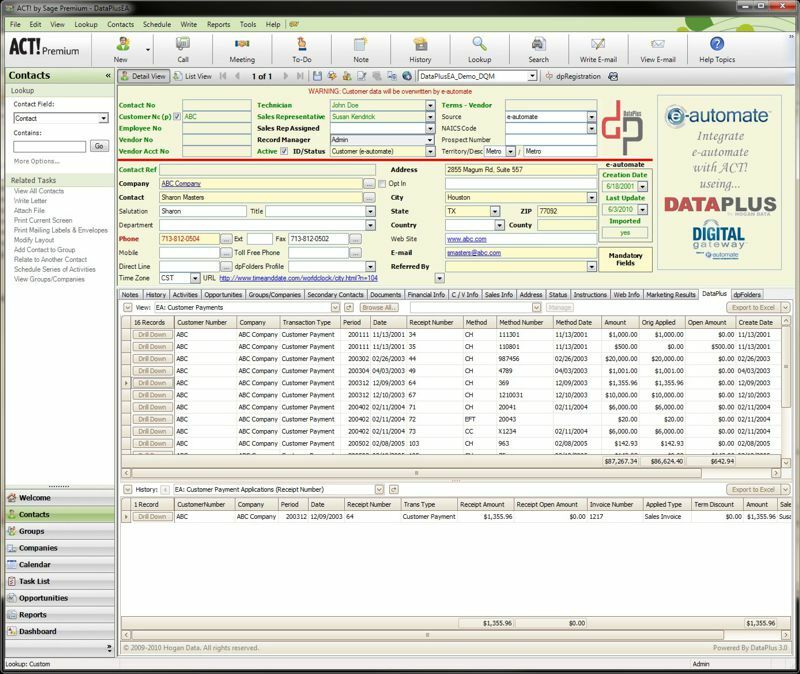 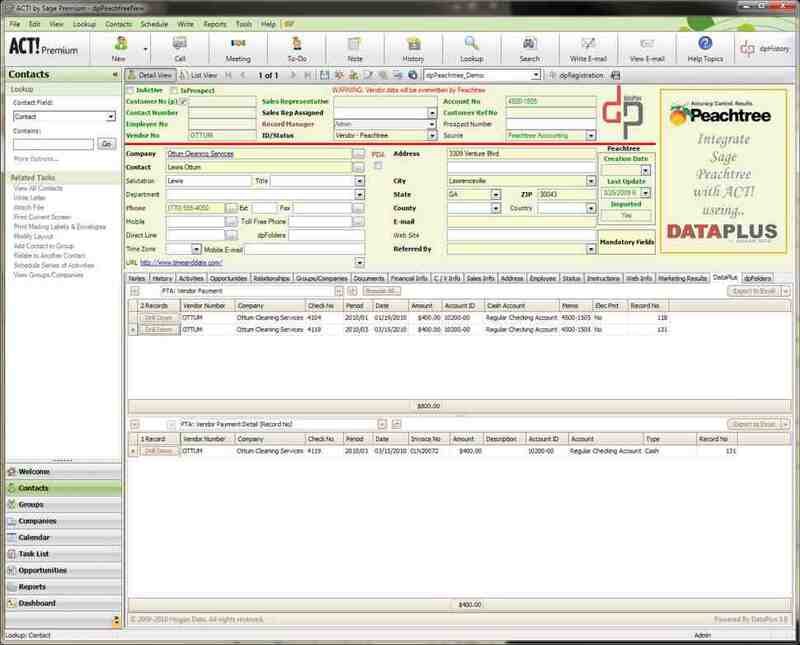 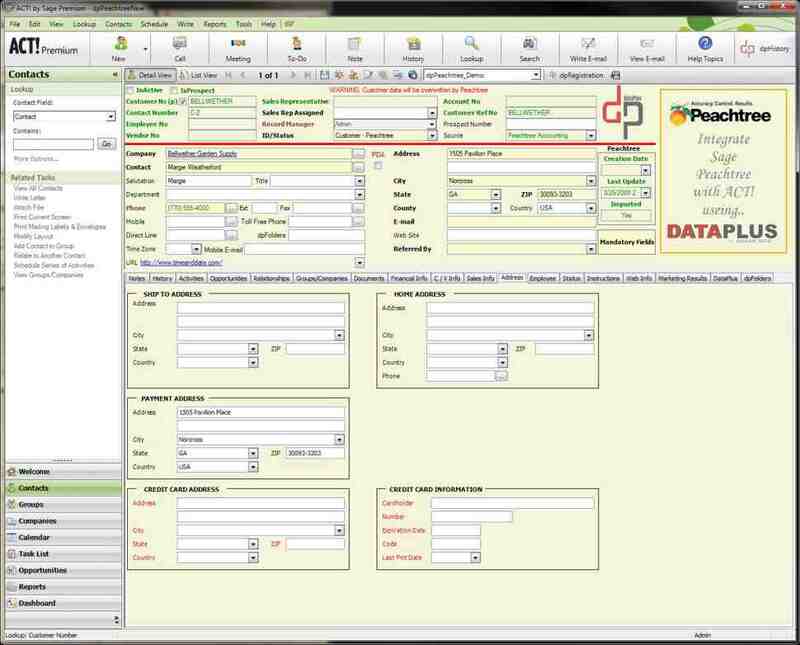 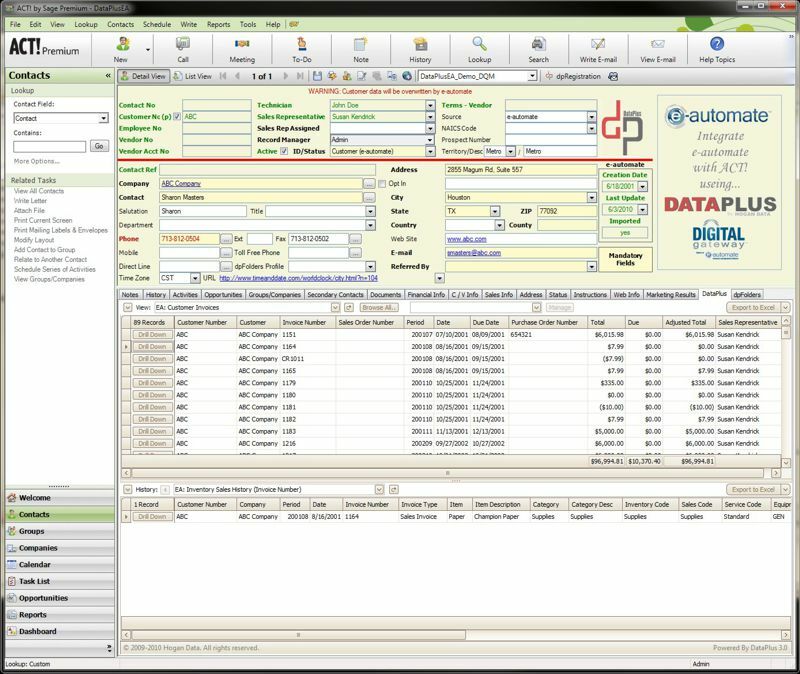 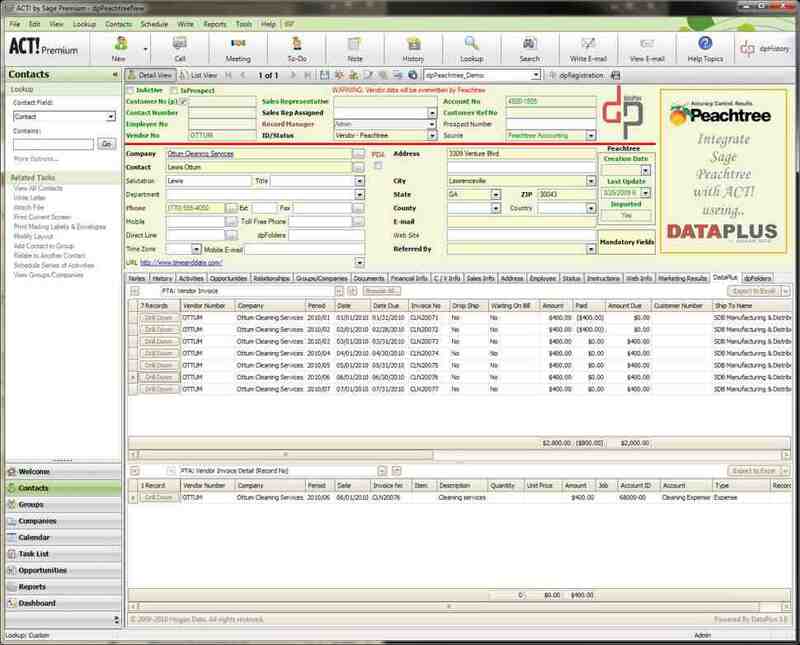 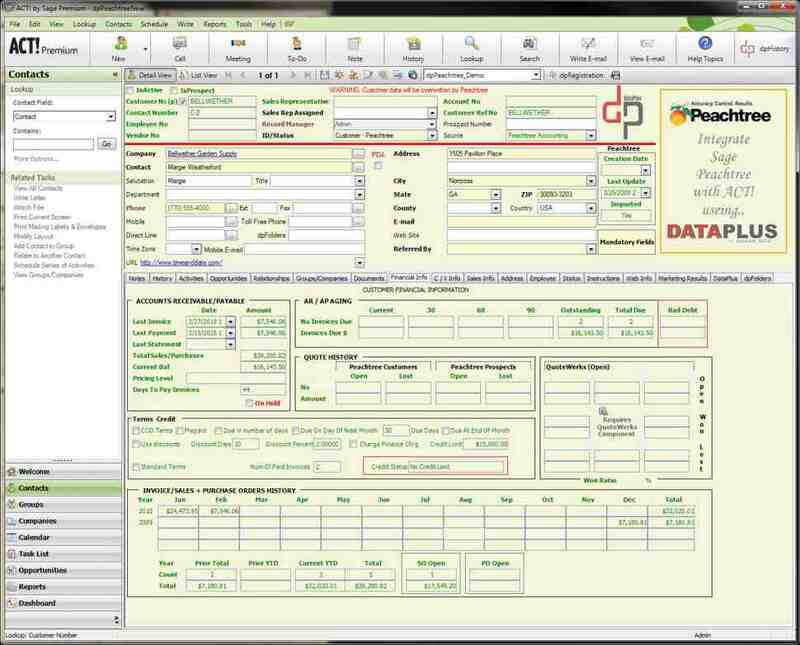 users access critical and statistical information from e-automate in Act fields for Customers, Vendors and Employees! 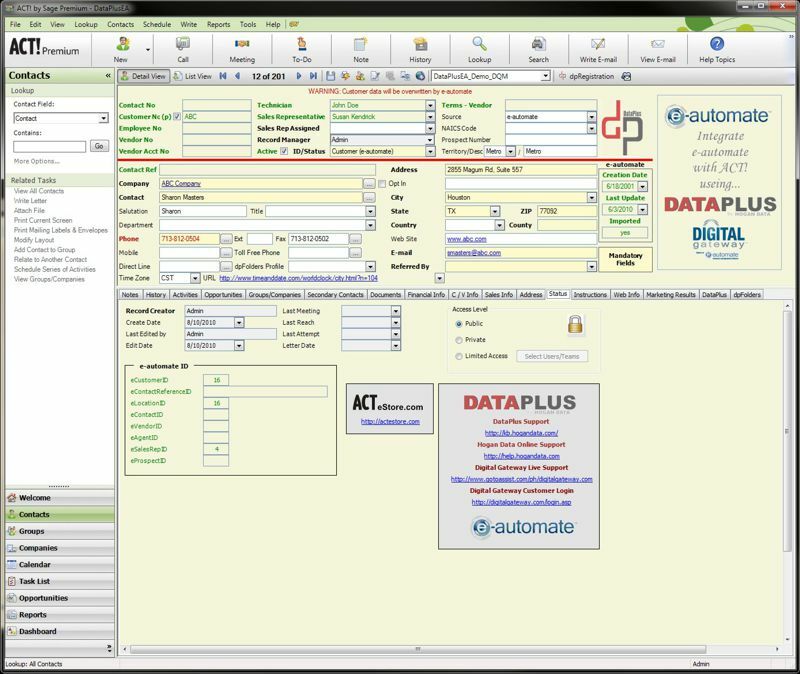 Security access controls for e-automate data in Act! 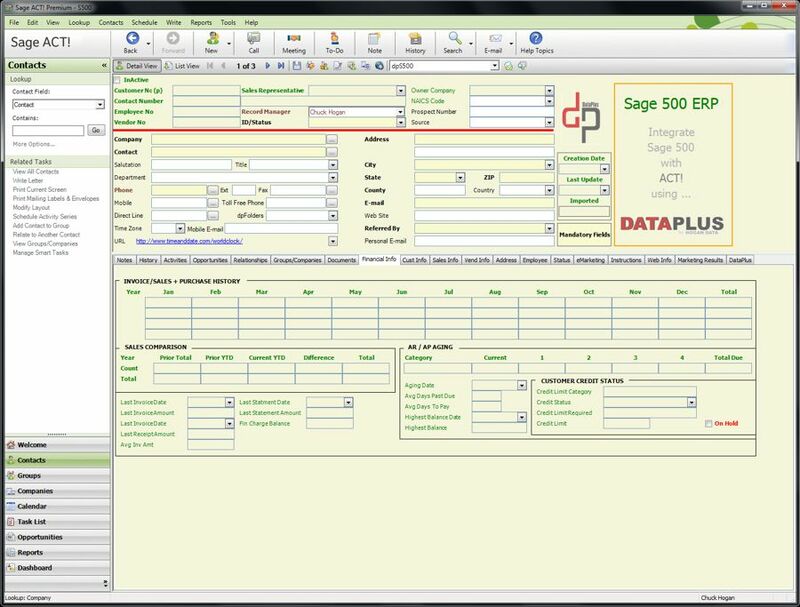 Using DataPlus, Act! 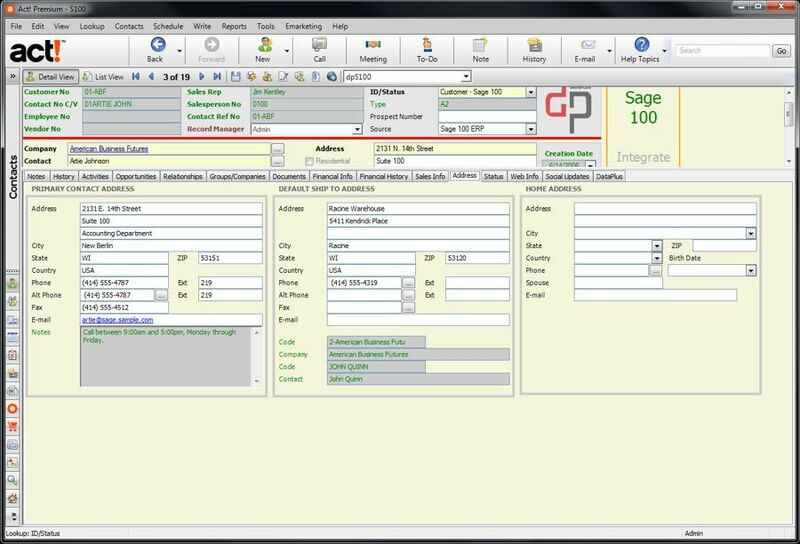 users access critical and statistical information from SAPOne in Act fields for Customers, Vendors and Employees! 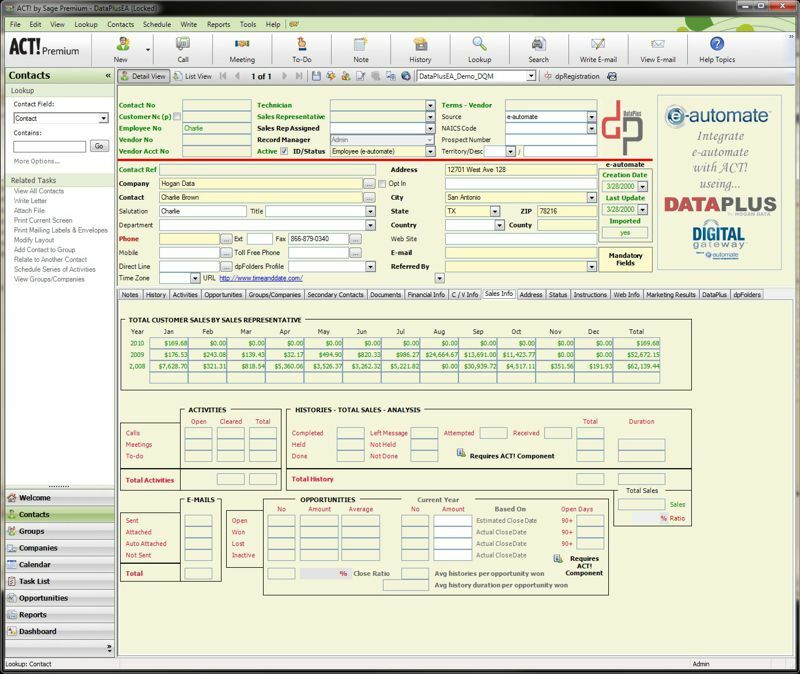 Security access controls for SAPOne data in Act! 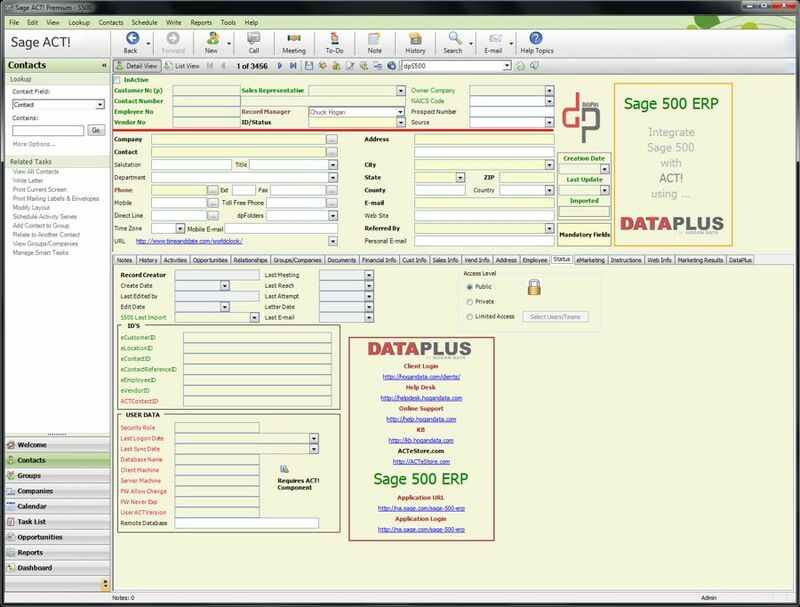 Using DataPlus, Act! 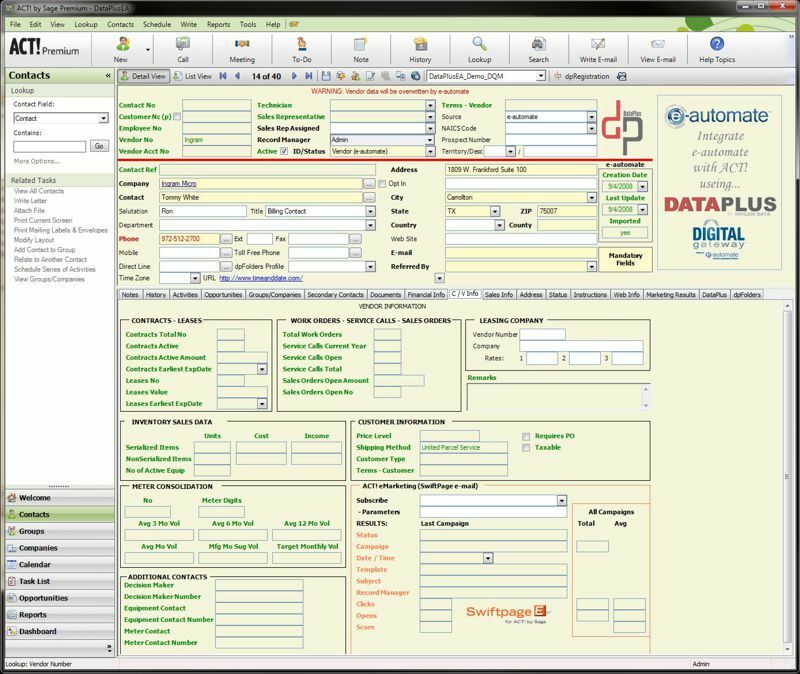 users access critical and statistical information from Syspro in Act fields for Customers, Vendors and Employees! 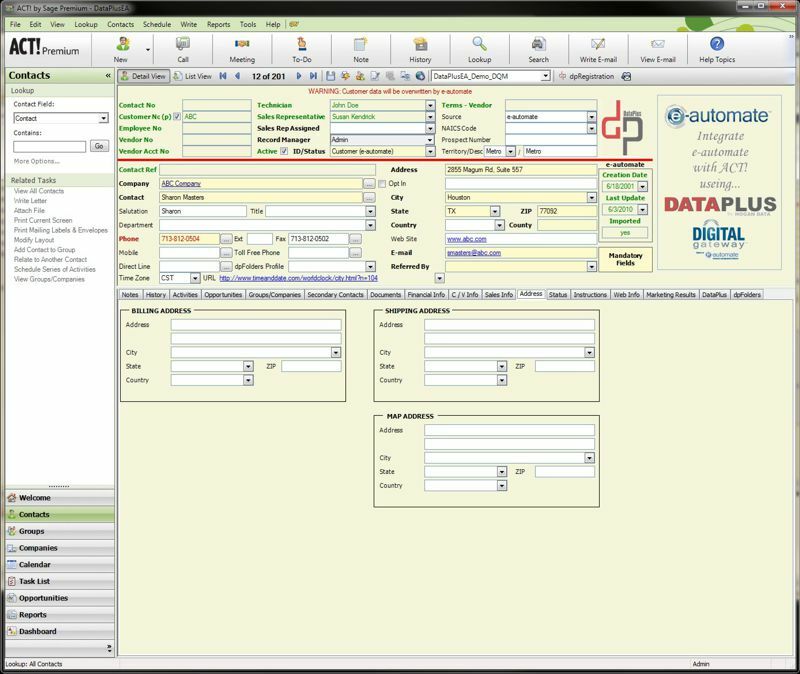 Security access controls for Syspro data in Act! 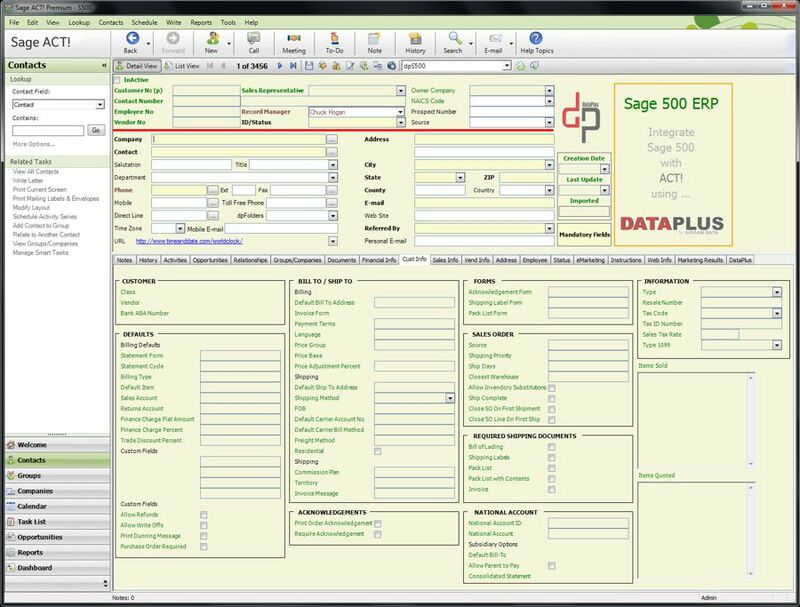 Using DataPlus, Act! 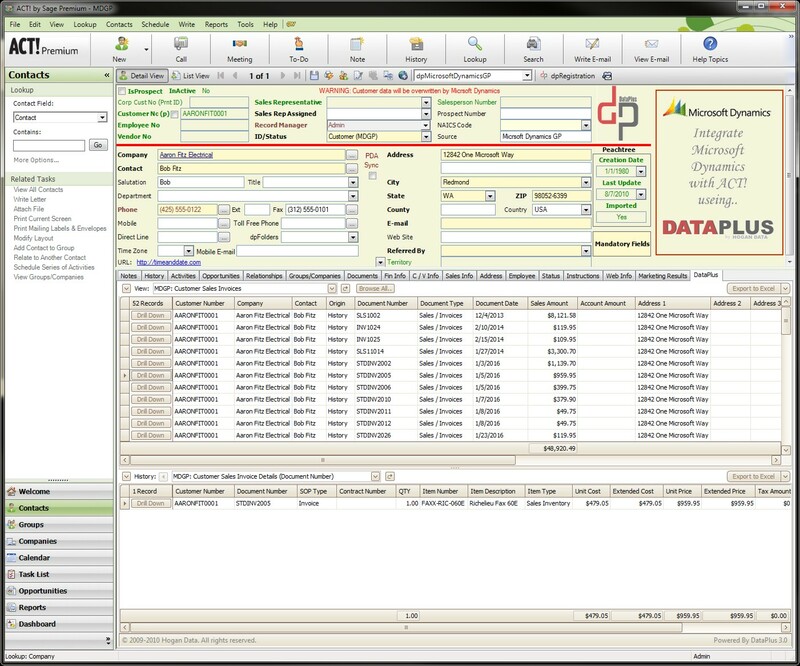 users access critical and statistical information from medisoft in Act fields for Customers, Vendors and Employees! 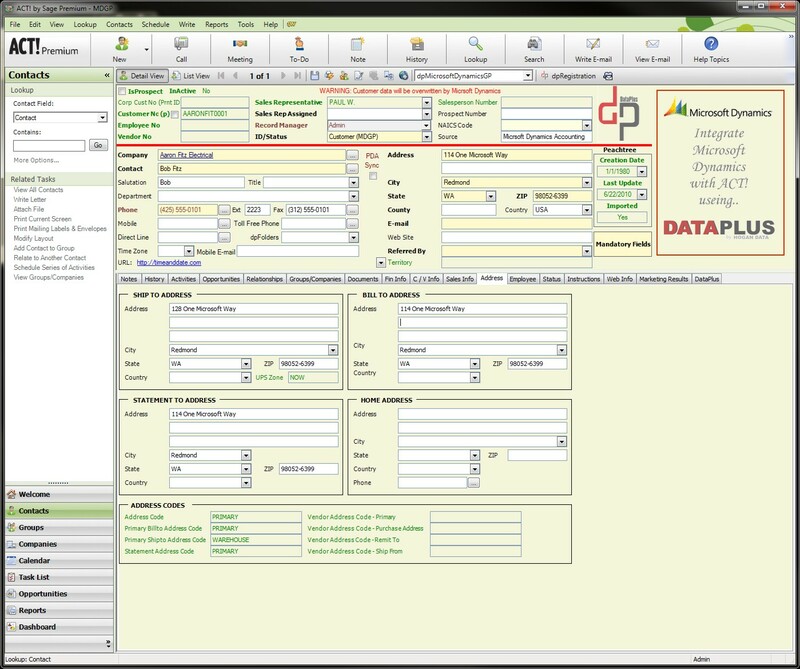 Security access controls for medisoft data in Act! 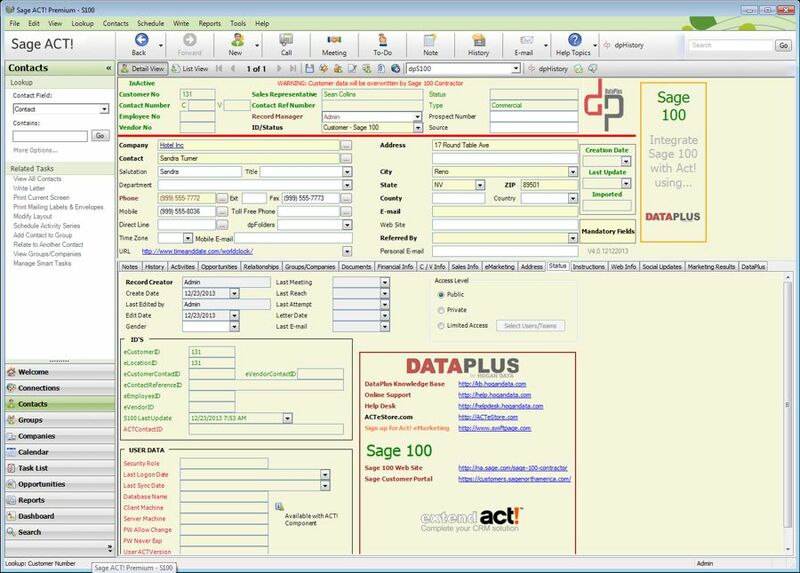 Using DataPlus, Act! 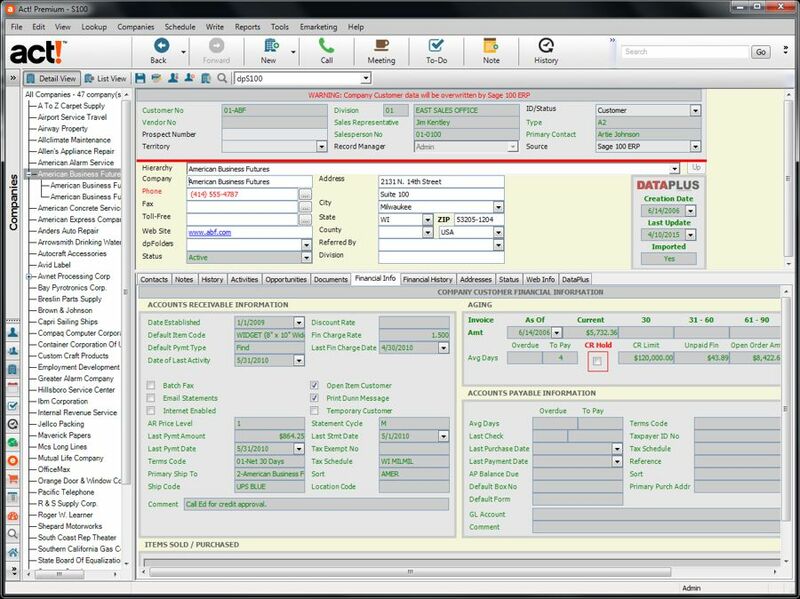 users access critical and statistical information from MR8 in Act fields for Customers, Vendors and Employees! Security access controls for MR8 data in Act!